Dissemination of information to members is an important part of APT’s activities. The APT's publications are produced to meet the requirements of our Members and to provide a platform for the global and regional dissemination of information. 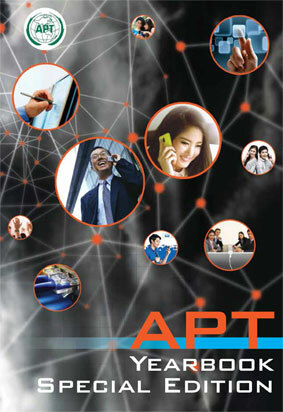 The APT also aims at promoting better understanding of the Telecommunity and the regional needs. The APT also fosters closer ties with our members through the APT Newsletter which is issued on a monthly basis. The publication serves as a vital medium for the Secretariat to disseminate telecommunications related information, activities, development, events and other related news on the region to APT members and outsiders. It also features highlights of recent and forthcoming APT activities, seminars, meetings and workshops. This prestigious publication was launched in 1994. The APT Yearbook is an excellent compendium for all telecommunication executives interested in the development of telecommunications and ICT in the Asia Pacific region. It gives the current status of telecom and ICT in the countries and territories of the Telecommunity. Much of the information is provided through the APT, making the APT Yearbook a truly unique and comprehensive source of valuable reports. The APT Yearbook – Special Edition* is the latest edition which provides the updated information on the country status with particular focus on Mobile, Broadband and related hot issues. The APT - Organization, role, membership, activities, etc. Member Country Profiles - Country-by-country insight into the current status of telecom & ICT, policy, regulations, future plans, etc. of APT Member countries. Associate Member Profiles - similar inforamtion as Section 2 for APT Associate Members. Affiliate Member Profiles - Company profiles of APT Affiliate Members which include over 130 companies/organizations/institutions.